This post brought to you by 3M. The content and opinions expressed below are that of Tech Shur. Sometime when you do something private, you do not want anyone else to look at your computer screen. There are many possible reasons why you want to keep it private. Like maybe you think that your work/idea can be stolen by a hacker around you. There is always a solution to any problem. And in this case, 3M’s ePrivacy Filter Software is the best fit for you. 3M’s ePrivacy Filter is a software that learns the user’s face through its facial recognition software by using the computer’s webcam. Once the software is installed in your computer, its facial recognition feature will see you and remember your face. This feature is designed to reveal the computer screen to the authorized-user (you) only. If the user looks away or steps away from the computer, the screen will be blurred so that no one else could see what you were doing. Cool? Yeah.. But what if someone behind you is tracking all your activities? Well they will be detected by the software and will alert you using a pop-up screen with the intruders face. If the software is combined with a 3M™ Privacy Filter (physical filter) then you can get true 180-degrees visual privacy. I would recommend 3M ePrivacy Filter Software if you want to protect your computer activities from anyone around you and want a complete visual privacy. The software is currently available to Windows only and requires a webcam. If you are on Windows OS and have a webcam, you should Download a 30-day free trial of 3M™ ePrivacy Filter Software . After downloading enter the activation code (VX7J-3CVJ-AyW2-X4PQ) to start your 30-day trial. 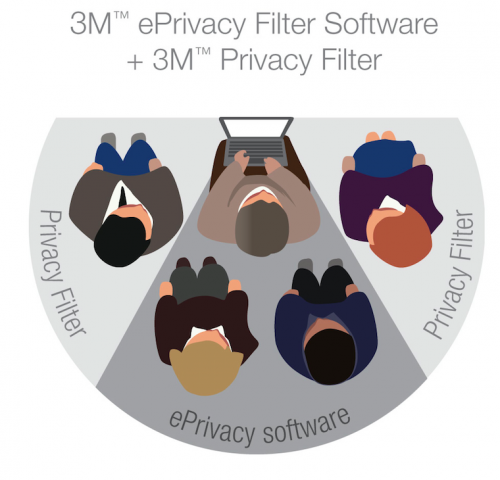 If you still have confusion, you can Learn more about 3M™ ePrivacy Filter Software.